Layout. Specifies the portal-level settings and the page and banner layouts. Insert. Inserts an item from a page to a report. Style. Applies styles to common properties (background, border, and font). The following image shows the Layout tab. The layout tab has two groups, Portal and Page & Banner. The following topics describe the options in the Portal group. 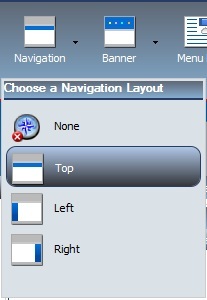 The following image shows the Choose a Navigation Layout option. None. There is no navigation menu. Top. The navigation menu is located beneath the banner at the top of the window. This is the default layout. Left. The navigation menu is located on the left side of the screen in the left banner. Right. The navigation menu is located on the right side of the screen in the right banner. The following image shows the Choose Banner Areas option. A banner is an area that is visible in the portal no matter what page you are on. 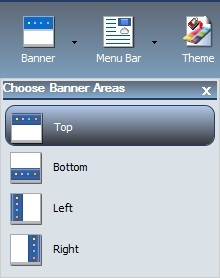 You can choose to have no banner or any combination of top, bottom, left, and right banners. Top. The banner is at the top of the window. This is the default area. Bottom. The banner is at the bottom of the window. Left. The banner is at the left of the window. Right. The banner is at the right of the window. Click each menu option to turn the associated banner on or off. The following image shows the Menu Bar. The next image shows the Select Location & Alignment option for the Menu Bar. Top Bar. The links are displayed above the top banner. Top Banner. The links are displayed within the top banner. This is the default location, with a right alignment of the links. Bottom Bar. The links are displayed below the bottom banner. The bar options are thin strips, either at the top or bottom of the window. They are always visible, no matter how far down or up you scroll. In each of the locations, you can choose alignment options as shown. For example, you can align the links to the left, in the center, or to the right. The following image shows the Choose a Theme option. On the Theme menu, you can select from several predefined themes, including a Custom theme. Each theme controls the styling of the banner, the page tabs, the panels, and the styling of the reports. Note: If you are using the Neutral theme, we recommend that you apply the ENWarm.sty StyleSheet to your content. This StyleSheet has been designed to complement the Neutral theme. For more information on changing a StyleSheet, see Portal Components. The default theme is Information Builders. The Security button launches the Security Rules dialog box, which enables you to specify an audience for the portal and add other designers. The following image shows the Security Rules dialog box. BIPCreatePortal. Allows you to create a portal. BIPFullControl. Gives you design access and personalization features on a portal. BIPViewAndCustomize. Provides access to run-time mode only. It saves the position of any content that you rearrange and lets you add new content to your copy of the portal. BIPViewOnly. Does not save anything that you do in run-time mode. One use for this operation is anonymous access. The Properties button makes the current portal the selected object. It also sets the Properties panel at the bottom of the Portal Designer window so that it applies to the current portal. The Properties button is shown in the following image. The Page & Banner group has a single Layout button. The following image shows the Choose a Layout option. The following image shows the Insert tab. Pages. Adds a new page to the portal. Containers. Adds a panel, accordion, tabbed, or responsive container. Content. Inserts WebFOCUS content (for example, reports, charts, documents, dashboards, and URLs), images, a Resource Tree, a Portal Tree, and text. The following image shows the Style tab. 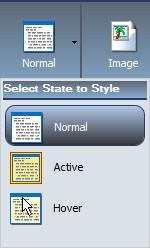 The following image shows the Select State to Style option. Normal. This is the default state of an object in which an event, such as a hover, is not occurring, or if styling for that event is not defined. Active. This is the state in which the object is currently in use. An example is the background color of the current page tab. Hover. This is the state in which the mouse cursor is resting on the object. You can use an image, a color, or a combination of options when styling the background of an object. The Image button is a split button. Clicking the left side of the button launches an Open dialog box. Clicking the right side of the button displays the Background Image Options. The Background Image Options are as follows. Click Change Image to launch an Open dialog box, as shown here. This is the same as clicking the left side of the split button. 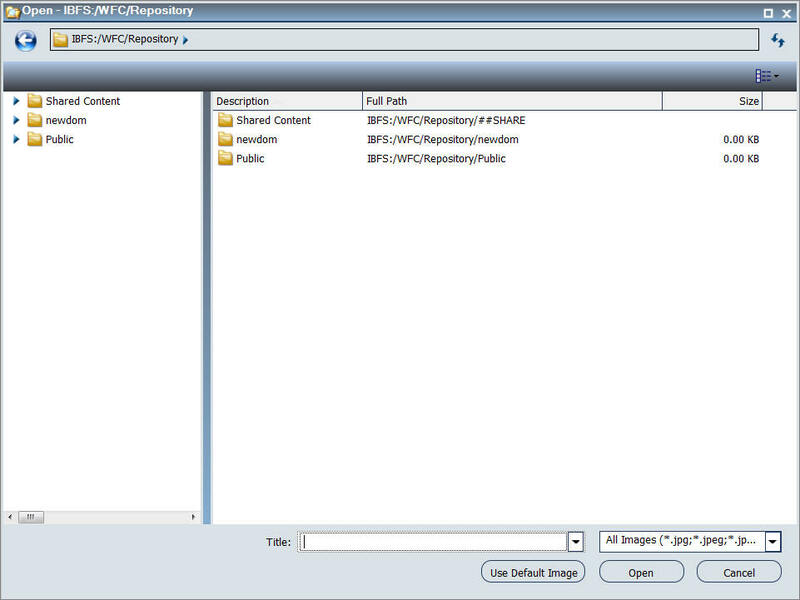 From this dialog box, select an existing image in the WebFOCUS Repository to use as the background, and click Open. To add a new image, use the WebFOCUS Resource Tree, and right-click the folder that you wish to place the new image in. Select Upload, Image. 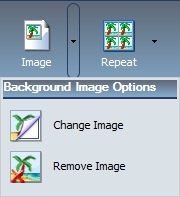 The following image shows the Select Background Repeat option. None. Displays the background image only once. Everywhere. Repeats the background image horizontally and vertically. This is the default value. Horizontally. Repeats the background image horizontally. Vertically. Repeats the background image vertically. The following image shows the Select Background Position option. 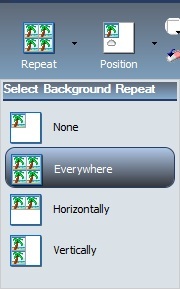 If you do not choose to repeat the image everywhere, you can select a background position using a visual menu, as shown. For example, you can position the background image at the bottom of the window, on the right. This feature is similar to Menu Bar positioning. 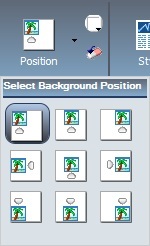 The default background position is top left. The color picker icon launches the color selection dialog box for setting a page background color. 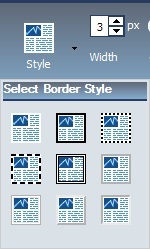 The same icon is used in the Border and Font groups to set the border and font colors, respectively. The reset background icon in the Background group resets the background styling to the theme settings for the currently selected state. The same icon is used in the Border and Font groups to reset those groups. In addition to color and reset, the Border group has style and width controls. The following image shows the Select Border Style option. The Width control sets the border thickness in pixels (px). If the style is set to none (the default for most objects), the Width control has no effect. 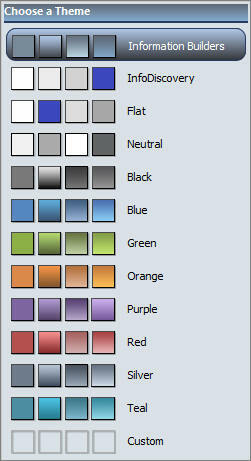 The color picker icon launches the color selection dialog box for setting the Border color. The reset border icon in the Border group resets the border styling to the theme settings for the currently selected state. The color picker icon launches the color selection dialog box for setting the Font color. The reset border icon in the Font group resets the Font styling to the theme settings for the currently selected state.